This article shows how to use the Speech Services through the Speech SDK for Python. It illustrates how to recognize speech from microphone input. An Azure subscription key for the Speech Services. Get one for free. Mac: macOS X version 10.12 or later. Linux: Ubuntu 16.04 or 18.04 on x64. On Windows, you also need the Microsoft Visual C++ Redistributable for Visual Studio 2017 for your platform. Updates to the Speech SDK Python package are distributed via PyPI and announced in the Release notes. If a new version is available, you can update to it with the command pip install --upgrade azure-cognitiveservices-speech. Check which version is currently installed by inspecting the azure.cognitiveservices.speech.__version__ variable. If you have a problem, or you're missing a feature, see Support and help options. Or you can download this quickstart tutorial as a Jupyter notebook from the Speech SDK sample repository and run it as a notebook. # Creates an instance of a speech config with specified subscription key and service region. # Replace with your own subscription key and service region (e.g., "westus"). speech_key, service_region = "YourSubscriptionKey", "YourServiceRegion"
# seconds of audio is processed. The task returns the recognition text as result. # shot recognition like command or query. # For long-running multi-utterance recognition, use start_continuous_recognition() instead. Download and install a 64-bit version of Python, 3.5 or later, on your computer. Open Visual Studio Code and install the Python extension. Select File > Preferences > Extensions from the menu. Search for Python. Create a folder to store the project in. An example is by using Windows Explorer. In Visual Studio Code, select the File icon. Then open the folder you created. Create a new Python source file, speechsdk.py, by selecting the new file icon. Copy, paste, and save the Python code to the newly created file. Insert your Speech Services subscription information. If selected, a Python interpreter displays on the left side of the status bar at the bottom of the window. Otherwise, bring up a list of available Python interpreters. Open the command palette (Ctrl+Shift+P) and enter Python: Select Interpreter. Choose an appropriate one. 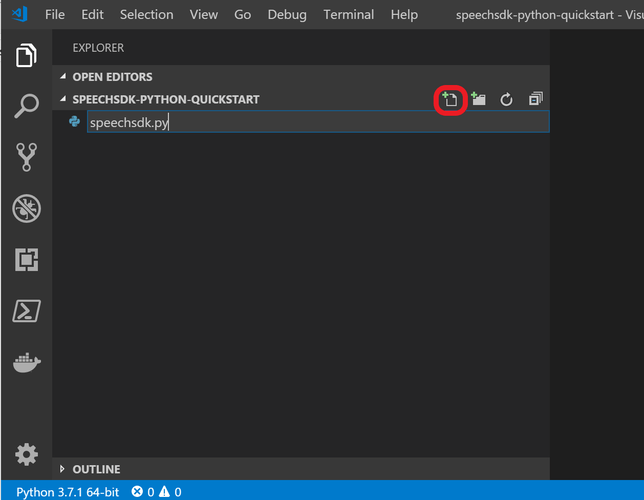 You can install the Speech SDK Python package from within Visual Studio Code. Do that if it's not installed yet for the Python interpreter you selected. To install the Speech SDK package, open a terminal. Bring up the command palette again (Ctrl+Shift+P) and enter Terminal: Create New Integrated Terminal. In the terminal that opens, enter the command python -m pip install azure-cognitiveservices-speech or the appropriate command for your system. To run the sample code, right-click somewhere inside the editor. Select Run Python File in Terminal. Speak a few words when you're prompted. The transcribed text displays shortly afterward. If you have issues following these instructions, refer to the more extensive Visual Studio Code Python tutorial.